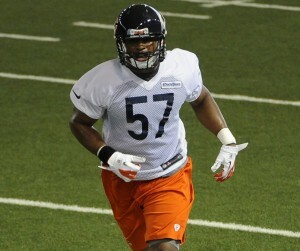 The Chicago Bears drafted linebacker Jon Bostic with the 50th overall pick in the second round of the 2013 NFL Draft. The 6'1, 245 lb Bostic started at middle linebacker during three of his four seasons at the University of Florida. He recorded 237 tackles, 19.5 tackles-for-loss, 8.0 sacks and five interceptions in 51 career games for the Gators. Bostic has participated so far in a rookie minicamp (May 10-May 12), OTA's (May 13- June 6) and a mandatory minicamp (June 11-June 13) in his time in the windy city. "I've got guys who played a lot of football in front of me. I've really been out there just trying to learn as much as I can day by day from the coaches and players." Bears' GM Phil Emery loved the fact that Bostic was a "three-position linebacker." That played very deeply into the decision to take Bostic over a guy like ILB Arthur Brown (Kansas State) in the middle of the second round. "I'm playing all the linebacker spots right now. In our defense you have to know all three. You have to know everyone's responsibilities. But most of the time I'm playing at Mike and Sam." He knows that he will have to earn his stripes through his special teams play. Although he doesn't mind doing just that he should be in a fair competition with off-season acquisition James Anderson at strongside linebacker aka Sam. "I'm really just looking to make the team and help out any place that I can. I just want to learn each and every day." Bostic played running back and defensive back at Palm Beach Central High School in Wellington, FL. He claims the transition to linebacker in college wasn't very tough. "The transition was actually pretty easy. I've always been a guy who liked being around the ball. I was just moving that much closer to the ball to be able to make more plays." Starting safety Major Wright was a senior when Bostic was a freshman at the University of Florida and now they both join forces once again. He has become friends with many players on the team, but he said one player in particular he has become very close with. "Khaseem [Greene]. Being around him, coming into together and really growing together each day we've gotten pretty close." Bostic’s father Jon was a former defensive back for the Detroit Lions (1985-1987). He loved watching football growing up. The NFL was a dream when he was a kid, but now its a reality for Jon Bostic. "That was something that I've dreamed about since I was little. It was something I wanted to do my first time putting pads on." Bostic earned his degree in health education and hopes to attend physical therapy school one day. He credits his parents for getting him to where he is today on and off the field. "They have been there for me from day one. They have taught me right from wrong. They always pushed me academically and made sure I graduated from college. The athletic part basically took care of itself." As a freshman in 2009 Bostic was a teammate of former Patriots tight end Aaron Hernandez at the University of Florida. "It's frustrating to see some guys you've played with make a mistake and basically get themselves in trouble. You have to make sure you're making the right decisions. The NFL has done their part by basically reiterating lessons that our parents have taught us." Bostic certainly has a bright future with Brian Urlacher out of the picture and Lance Briggs likely nearing the end of his career. He embraces the past "Monsters of the Midway" and wants to continue the success the Bears' defense has had. "It means a lot to play defense in Chicago. With the linebackers they've had in the past they've all done a lot of great things. I'm excited to keep the legacy going." Bostic is thrilled to be able to get a chance to learn from seven-time Pro Bowler Lance Briggs. "He knows the defense like the back of his hand. When I'm out there I watch him and just listen to how he communicates on the field with all the players."